Project Goals: Improve your New Year Resolutions! January is the month for New Year’s Resolutions. People commit themselves to goals for the coming year. Many resolutions are about becoming healthier, going to the gym and losing weight. These resolutions are the project objectives of little projects. How effective are they, and how can we make them better? People argue about whether resolutions are a good thing but continue to make them. As a Business Analyst I find myself involved in making project plans. People continue to make project plans, with varying degrees of success. What is wrong with our resolutions? One of the problems with objectives is the “Realistic” criterion. If we make it “reasonable” aren’t we just showing lack of imagination? But if we don’t make it “realistic” aren’t we simply setting ourselves up to fail. I will run a marathon by the end of the year. I really have no way of knowing whether or not that is “realistic”, “reasonable” or even “completely unachievable”. And that brings us to a common problem: we are not very good at estimating how much effort things will take. We start out optimistically with what turn out to be unrealistic expectations. The going gets tough. We beat ourselves up. We give up. How do we improve our resolutions and project objectives? The first improvement is to recognise that the “marathon” resolution may not be what we want. Maybe what we want is “to get fitter”. The “marathon” resolution may be SMART, but it may demotivate us. Would we really be disappointed if we were only able to run a half-marathon at the end of the year? The second improvement is to break the high-level “marathon” goal into smaller, more manageable goals, and then concentrate our energy on the next goal. 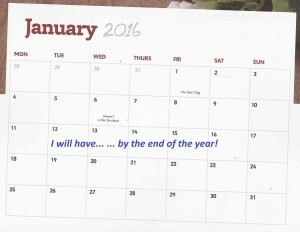 We can have a goal like “go to the gym every week” and aim to achieve that by the end of January (or whenever). How do we apply these lessons to our projects? When we are deciding on our project goals, we can apply the SMART principles to the project as a whole. Make the goal as challenging as you like. I find it useful to break the project into smaller goals. The SMART approach can be applied to each one of these. These smaller goals are easier to manage and more motivating. Author Tom GilliesPosted on 2016-01-11 2016-06-24 Categories 2016, Project ManagementTags project managementLeave a comment on Project Goals: Improve your New Year Resolutions!